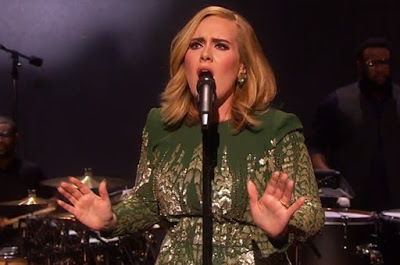 Set for broadcast on November 20 – the same day “25” hits stores – “Adele At The BBC” showcases an interview and performance from the UK pop star in front of a live audience. Hosted by Graham Norton, the 1-houtr special sees Adele answer questions from fans, including a rumor that she isn’t allowed to use Twitter without supervision. “But they're all my tweets. No one writes my tweets – they just post them for me." “Hello” is smashing all kinds of records since its release, which saw it debut at No. 1 in both the UK and the US. The tune delivered the biggest opening week for a No. 1 UK single in three years and a record-breaking 7.32 million UK streams, while becoming the first-ever song to sell at least 1 million US downloads in a week. Adele will launch “25” with a concert at Radio City Music Hall in New York on November 17 and a performance on NBC-TV’s Saturday Night Live on November 21.